Homebased in Portland, Oregon, the Pals of the Golden West began their western music in the late 1930s, harmonizing on station KOIN, the CBS radio station in Portland. The October 1, 1939 issue of Broadcasting magazine carried a blurb on the group: "THE 'Pals of the Golden West,' a girl and four youths who sing old-time songs on KOIN-KALE, have gone to Hollywood to appear in a Gene Autry film at Republic Studios." Gene Autry in ROVIN' TUMBLEWEEDS (Republic, 1939) and RANCHO GRANDE (Republic, 1940). George O'Brien in STAGE TO CHINO (RKO, 1940). Johnny Mack Brown in THE SILVER BULLET (Universal, 1942) and BOSS OF HANGTOWN MESA (Universal, 1942). 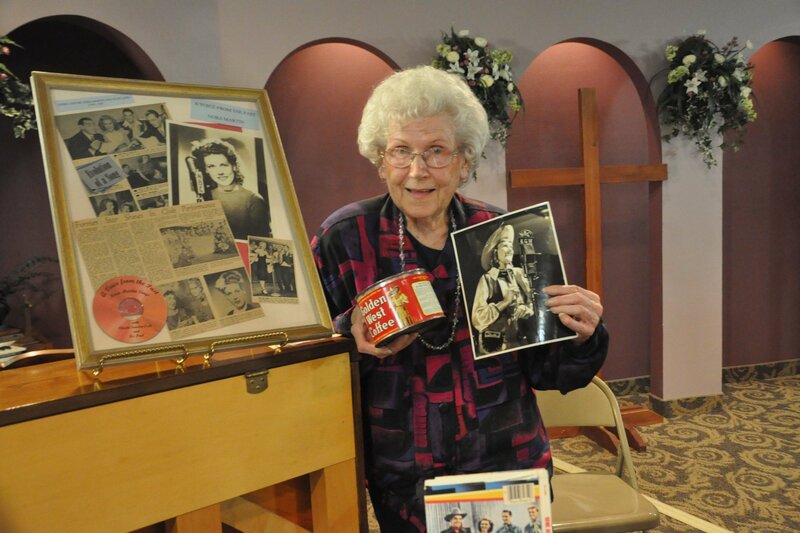 In addition to singer and yodeler Nora Lou Martin, members of the group included Larry Shaw (guitar), Howie 'Slim' Russell (bass), Roy 'Bud' Jackson (clarinet), and Art Wenzel (accordion). Scotty Harrell briefly replaced Shaw when he left for World War II service. The group disbanded circa 1942-43. After the war, Roy Jackson formed up a similar band in Portland (called "Roy Jackson and the Northwesterners"). Above is a late 1930s publicity still of the Maple City Four members that worked at Republic Pictures. It's autographed to prolific B-western supporting player Jack 'Pappy' Kirk. From left to right are Allan Richards 'Al' Rice, Art Janes (not James), Frederic William 'Fritz' Meissner and LeRoy Granville 'Pat' Petterson. The Maple City Four took their 'Maple City' name from LaPorte, Indiana, and they formed up in the mid 1920s and continued performing into the mid 1950s. They did comedy and their serious singing style was of the Barbershop variety. They were a fixture on the WLS (Chicago) Barn Dance radio program. Original members were Al Rice, Art Janes (not James), Fritz Meissner and Pat Petterson. Over the years, the membership changed, and my copy of the 1944 WLS Family Album magazine shows Meissner and Petterson with 'Skip' Farrell and Pete Taflinger. In the late 1930s, the Maple City Four were at Republic Pictures doing their musical hijinks for Gene Autry in GIT ALONG LITTLE DOGIES (Republic, 1937) and THE OLD BARN DANCE (Republic, 1938), and in Roy Rogers' first starring picture, UNDER WESTERN STARS (Republic, 1938). Above is a image of Curt Barrett and the Trailsmen from the pressbook from the Johnny Mack Brown THE GENTLEMAN FROM TEXAS (Monogram, 1946). Gerald Curtis 'Curt' Barrett is on the far right with the guitar. Kevin Coffey e-mailed with identification of the band members. From L-to-R are: Harry 'Slim' Duncan, fiddle; unidentified, piano; Stanley Ellison, accordion; probably Clarence 'Bud' or 'Jerry' Dooley, bass; Curt Barrett, guitar. Special thanks to Nora Dunagan for the info on her Grandfather, Curt Barrett. Gerald Curtis Barrett was born June 22, 1906 in Morehouse, Missouri and passed away on April 2, 1989 from a heart attack. He lived in North Hollywood, California and is interred at Valhalla Memorial Park in North Hollywood. He was married three times: to Mary Shy (in 1926); to Leonora Arlene Dunagan (in Balboa, California, 1929); to Margaret 'Peggy' Ehrenschneider (in St. Louis, 1933). Curt Barrett and the Trailsmen appeared in a handful of oaters during the mid 1940s, including the Charles Starrett GUNNING FOR VENGEANCE (Columbia, 1946) and Johnny Mack Brown sagebrushers DRIFTING ALONG (Monogram, 1946) and THE GENTLEMAN FROM TEXAS (Monogram, 1946). Curt Barrett also had a few solo movie appearances as well as work in some 1950s TV shows.